Bariatric Wheelchairs with reinforced heavy-duty frames and wider seat size selections. Bariatric chairs have weight capacities all the way up to 1000-lbs. E&J Heavy-Duty Transport Chair has 12" flat-free rear wheels that make it easier to push a heavier patient. Sentra EC offers 26"-28" seats with deeper 20" seat depth. 700 lbs. weight capacity. Removable arms, optional front riggings. 26" Wide seat, 600-lbs weight capacity, removable desk length arms. 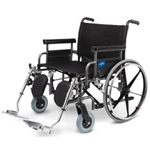 Heavy-duty wheelchair has flat-free tires and 8 spoke mag wheels. 650-lb capacity and is available in 26"or 30" seat widths. 700-lb or optional 1000-lbs weight capacity. 20"-30" seat widths. 850-lb capacity available in 24" - 30" seat widths. 650-lbs capacity, folds and has that nice Quickie look to it. Merits P183 has 26"W x 20"D seat and 700-lb weight capacity. Powerful chair with flat-free tires goes anywhere. Runs up to 4mph with 15mi. range. Includes foam-filled flat-free tires. Merits P182 has 24"W x 20"D seat and 600-lb weight capacity. Powerful chair with flat-free tires goes anywhere. Runs up to 4mph with 15mi. range. Merits P327 Vision Super Bariatric Power Chair with 450-lb capacity, 22" wide seat, 15-20 mile range and maximum speed of 5 mph. On sale now with Free Shipping. 600 lbs. capacity, 24" wide seat available with Captain's Seat or Pan. P710 Atlantis has 30 mile range and maximum speed of 5 mph.